We are proud to announce the launching of the game app to memorize the 72 names! The 72 names are spiritual bridges that connect the light from Zeir Anpin to Malchut. The purpose of this game is to help you memorize the entire sacred 72 names in their correct position. With every name we memorize we create an important bridge of light to our vessel. Currently avaialble only for iOS devices. The 72 names are as the Zohar explains, bridges that connect the light from Zeir Anpin to Malchut. The Zohar (Vayera #282) reveals that man was created with 248 body parts that represent the 216 letters of the 72 names and 32 paths of wisdom formed in the process of Creation. 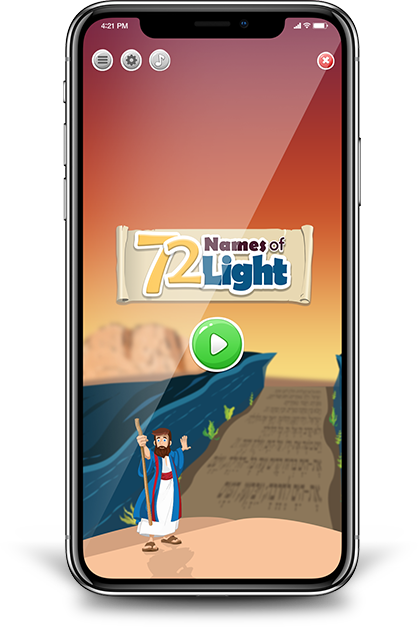 The purpose of this game is to help you memorize the entire sacred 72 names in their correct position. Having these bridges of Light in our mind would open and expand our vessels for great light that would improve many aspects of our lives. It’s not just an enjoyable game, It’s a spiritual connection made each time we place a name in its position. 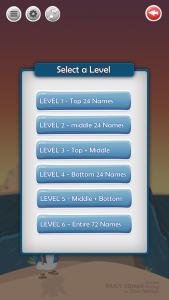 We designed the levels of the game in a way that will make it easy for us to memorize the entire chart. The time you spend on this game is pure light. Since this game show holy names, please be properly dressed before you play with it. The development of this app cost us significant amount of money. The app stores collect 30% fee from every purchase. 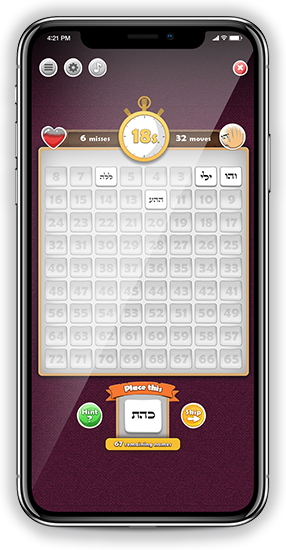 This is not like a common game on the app stores and we need your help to promote it among students of Kabbalah. We need to make many sales to break even and B”H also some profits to invest in new apps and wonderful DZ projects. The 72 names game is a memory game to help you remember the 72 names chart and the position of each name. Even without scientific data, I believe that this special game could improve memory of the player because each name is a name of Light. The purpose of the game is to place the names in their correct positions as fast as possible. You may be slow at the beginning but as you continue with the game, you will increase your memory and speed. The 6 levels were designed to help you memorize the entire chart gradually. On the website https://DailyZohar.com/72names/ pdfs you will find a pdf with printable charts for all levels to study and have while playing the 72 names memory game. Start at level 1 until you master it then move to the next level. At the bottom of the screen you see one of the 72 names, randomly selected from the name pool of that level. Locate the position for that name and tap on it. If you place it correctly then the name becomes ‘fixed’ on the chart and a new name will be shown at the bottom. You may hit the ‘Hint’ button to get the correct place for the current name. The correct location would be highlighted. You may also use the ‘Skip’ button to go to the next name and reduce the number of incorrect movesof hints that reduce your score. There’s no limit to teh number of hints you can use. Same methods for all teh other levels. The entire chart of the selected level displayed randomly on the board. Select any of the names and tap on it to drag and drop it into its correct position. Once placed correctly it will stay unmovable in its place. You may hit the ‘Hint’ button to get the correct place for the current name. The ‘Skip’ button isn’t functional in this game mode. Place the name in the correct position. find the correct position. Tap ‘Hint’ button to reveal its place during teh learning process. You must place the most of names in their correct position before the time is up. The 72 Names of Light game doesn’t collect any user data. You may share your score on Facebook and Twitter using the links in the app. We do not track such activity.